On March 29th, sprite will release their very first game on Nintendo Switch: a port of Ao no Kanata no Four Rhythm. And the good news is, despite the game not launching for another three weeks, it’s already on the way to make them money. Via their Twitter account, sprite announced that with the first shipment, the Nintendo Switch version of Ao no Kanata no Four Rhythm was already profitable. In other words, unless retailers end up ordering way too many units for launch week, the game is bound to start making money from launch week alone. This is a pretty positive sign, especially for a genre that’s still unproven on Nintendo Switch (and Nintendo consoles in general). However, that does not mean this version of Ao no Kanata no Four Rhythm is going to sell gangbusters or anything: Visual Novels always have pretty “niche” sales on consoles (especially if they’re a port of a PC game, which is the case of the majority of them. It’s even more true if the original version on PC is adult-only, which is the case of this particular game). It’s unlikely this one will be any different, with pre-orders expected to make up the vast majority of first week sales, and first week sales making up the vast majority of total sales. Considering Nintendo cartridges are pretty expensive, it’s good news that the game is already profitable with just the first shipment. After all, even though Ao no Kanata no Four Rhythm is not that big a game (about 6.4GB), cartridge costs are still going to eat up a significant portion of the revenue generated by the game. Of course, that doesn’t take into account digital sales, unaffected by that, but those are bound to be even more limited than the physical sales. With Ao no Kanata no Four Rhythm already profitable with just the first shipment, it’s likely sprite will consider bringing more games to the Nintendo Switch (starting with the sequel and spin-off), and that other Visual Novel publishers/developers will take note and bring their own games to the console. 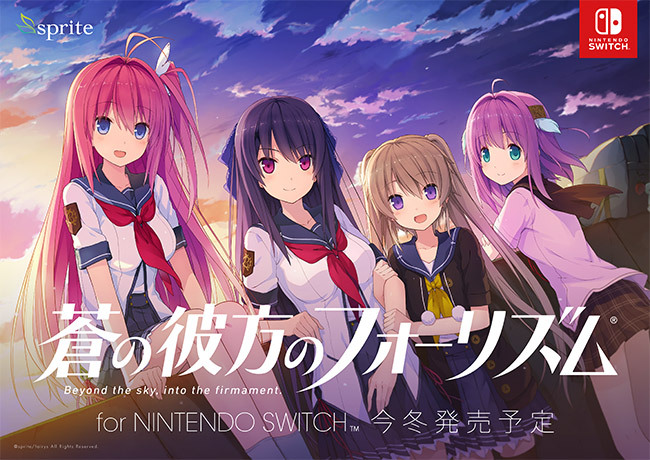 Ao no Kanata no Four Rhythm (Switch) comes out on March 29th in Japan.